I've always admired Pink Lining for their beautiful unique designs in both their changing bags and accessories for adults and their adorable childrens' lines. I was really excited when given the chance to work with them and was asked to tell them my favourite three bags from their large range. I found it hard to narrow down three but I managed it somehow and was delighted when I opened up the box to unveil my first choice bag wrapped up in a beautiful pink tissue paper and ribbons. 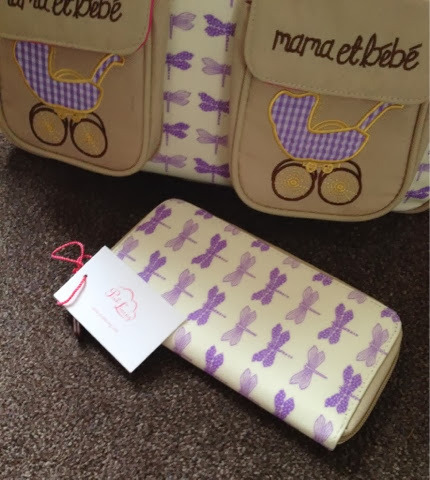 The bag I am talking about is the 'mama et bebe' in purple dragonflies. I chose this one as I love the pushchair motif on the pockets and I adore the dragonfly print. The changing bag itself is 100% cotton canvas laminated with EVA coating. 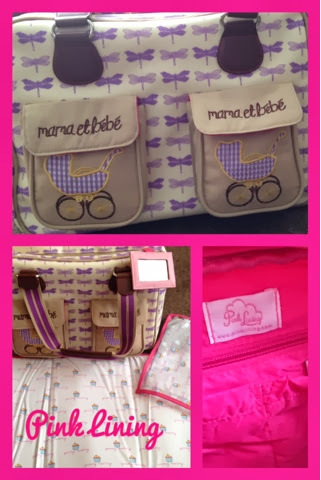 It has two exterior canvas pockets with the classic 'mama et bebe' slogan and pram applique. The bag comes with a detachable shoulder strap which extends long enough to fit on any buggy handles. The inside features the famous pink lining that gives the company it's well known name. Inside there are two insulated bottle pockets, two nappy pockets, pen holder, key fob, mirror, phone pocket, small zip pocket, removable padded changing mat and wet zip bag. They have thought of everything a parent would need when designing the inside of the bag, it is amazing just how much you can fit inside! As a parent of two I need to carry a lot when going out for a day yet still manage to go out solely using my pink lining bag to store everything we need. You can see an 'in action' picture below. I love the attention that having a pretty change bag brings and this one has not disappointed! I have received numerous compliments thanks to the bags beautiful design and I love it so much I have just bought the matching purse in the sale over on the Pink Lining website. In fact the bag is now also in the sale for just £39.50!! So if you like it grab one now before they are all gone! If you are not a fan of this particular colour or style I would still recommend you take a look at what they have to offer and grab yourself a bargain. I'm so happy with the quality of my Pink Lining products that I am considering getting Gracie's first ever school bag later in the year ready for Nursery in September. I'm looking forward to seeing the new season kids lines as much as the adults! 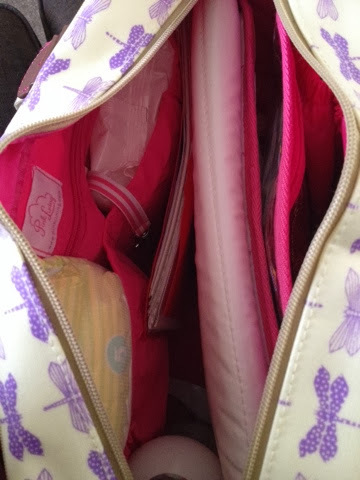 I was sent the Pink Lining Mama Et Bebe Changing Bag free of charge for the purpose of this review. All opinions are my own. 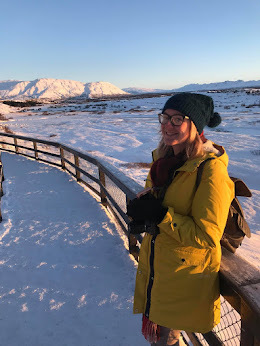 Britmums Winter Adventures with Barny!